Rainbow Lid wood Pipe with lid. Its about 4 inchs Long. 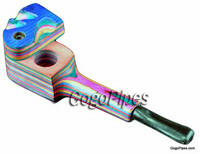 Pros: For a small pipe on the go for a great price- rainbow colors! Pros: Love the lid! Never owned a pipe that had a lid. Since I tend to tip them over for some reason this is exactly what I needed! Also I very smooth feel to the wood with great colors. Fits perfectly in a smaller hand, which I have. Cons: Small bowl. Would like it alittle bigger.